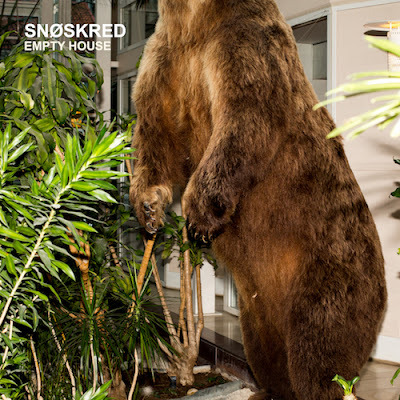 Snøskred are a 4-piece from Trondheim in Norway, who have been together since 2010. This year sees the release of their new album - 'Empty House', which follows their 2012 debut 'Whiteout' both through the Riot Factory label. The 8-track album has been self-produced by band members Karl Klaseie (vocals/guitar) and Kyrre Laastad (drums), and was recorded in the Greener Studio in Trondheim with help from Simen Hallset of Gold Celeste. Karl and Kyrre are joined by Lars Ove Fossheim (vocals/guitar) and Martin Hvidsten Berger (bass), who together have been working on this album for over year. Having initially released the album in their homeland and receiving a very warm reception for the single 'Puzzle', now it's time for the rest of us to sample the band's delightful blend of gentle vocals and subtle musicianship, which puts rock and pop together in a delicate yet unhinged way. Opening tracks 'Motor City' and 'Matador' ease everyone in before the tempo is moved up with 'Preparations'. Next is our favourite song 'Blurred Out Lights' which contains a multitude of guitars and climaxes with a feedback led onslaught (of sorts). This is followed by the new single 'Mirage' and another fuzzy guitar led song in 'Lexington Hotel'. The final two songs are the aforementioned 'Puzzle', and the final track 'Homeless' which typically follows the nature of the whole record in being unassuming, yet purposely so to allow the listener's thoughts to interweave with that of the band. Empty House is a beautiful album which has clearly been thought through well, with much time spent ensuring the flow, tempo, direction, and feeling are all in perfect alignment. We're left with a record that is wholesome, honest, and ultimately a compelling all-round listening experience.